Fall harvest time is all about abundance. My favorite vegetarian meals, Buddha bowls, are similar: They make me think of a rich bounty of healthy, nutritious and delicious plant-based foods. 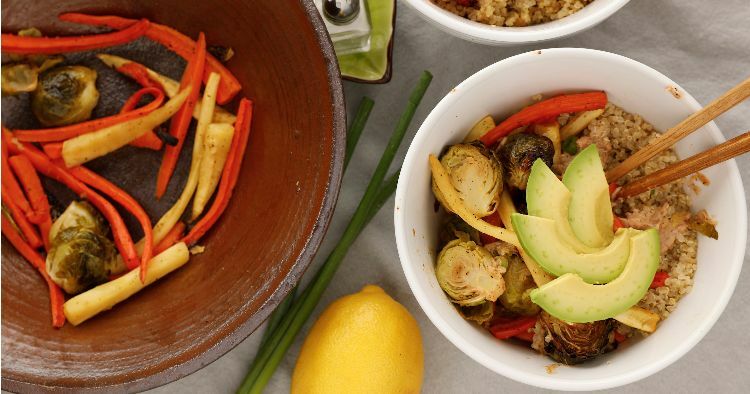 The recipe below combines the hearty, earthy veggies we associate with the fall harvest with the idea behind Buddha bowls. It’s a one-bowl vegetarian meal that will fill you up and leave you feeling grateful for all the amazing food that grows from the ground. The great thing about Buddha bowls is that you can easily personalize them. I love this particular combination of veggies, but you can substitute whatever you like — sweet potatoes, white potatoes, turnips or broccoli all roast well. You may need to adjust cooking times. Preheat the oven to 400ºF. Line a large, rimmed baking sheet with aluminum foil or parchment paper. 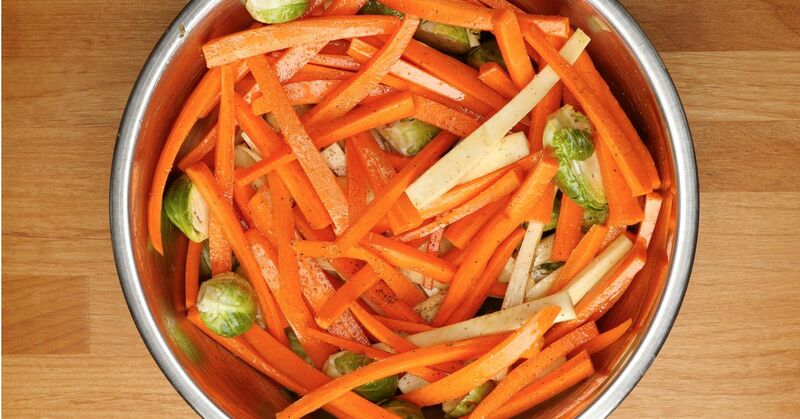 In a large bowl, toss the Brussels sprouts, carrots and parsnips with the olive oil, maple syrup, salt and pepper. Spread the vegetables on the prepared baking sheet and roast in the preheated oven for 20 to 25 minutes, until softened and beginning to brown. Prepare the dressing in a medium bowl by combining the tahini, lemon juice, syrup, vinegar, salt and pepper, then stir to mix well. Add the water and mix to incorporate. If the dressing is too thick, add additional water as needed. To serve, warm the quinoa, if needed, and then divide it and the roasted vegetables among 4 serving bowls. Top each bowl with some of the roasted vegetables. Drizzle the dressing over the top and serve garnished with scallions. Pro-tip: Slice up avocado and top on one side of the bowl.